From the most prominent qualities of the Hajurites is that they adopt and hold on to positions the realities and implications of which they do not fathom and then they fight tooth and nail in order to defend these positions agressively. Then when they are refuted and the writing on the wall is shown to them and the appropriate rulings are made upon them (as in they are made to understand the reality of what they are saying), they start jumping up and down, crying like children, claiming they have been oppressed. In this article we want to demonstrate this a little more clearly inshaa'Allaah. First, one should understand the gross error of the Hajurites in reviling Uthmaan (radiyallahu anhu) by ascribing bid'ah, dalaalah, mukhaalafah to his action in instituting the first adhaan of Jumu'ah, and which al-Hajuri describes as "umm al-bid'ah" (a mother of innovation). Pay attention at this point that al-Hajuri states that this was from Uthmaan's ijtihaad (intending by that to show that he does not speak ill of Uthmaan). We have documented these statements in other articles (see this article). 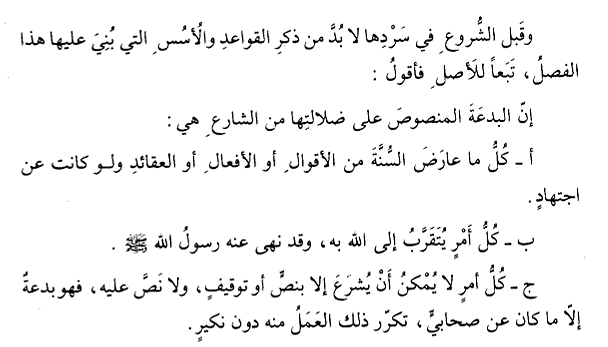 Al-Hajuri also makes tabdee (declares an innovator), after clarification, of anyone who implements the Sunnah of Uthmaan (radiyallaahu anhu) [which is to make use of a second adhaan where the situation requires that (see elaboration by Shaykh al-Albani)]. Making taqleed of Yahya al-Hajuri in this misguidance, is the Hajurite, Musa Millington who stated on the al-Oloom website (see image), "Saying that the adhaan of Uthmaan is a bid'ah does not necessitate declaring Uthmaan bin Affaan an innovator." The saying of some of them, the division of some people of the Innnovators into callers to their innovation and other than the callers to innovation, do the evidences support this division? Is it correct or futile? Al-Hajuri has also repeated this in other cassettes of his. Al-Hajuri is very explicit in affirming he is opposing the majority of the Scholars of Ahl al-Sunnah and their leading Imaams in this regard. What is the significance of this? It's significance is that it necessitates, upon the view of al-Hajuri and Musa Millington and the Hajurites in general (who hold that Uthmaan's action was a blameworthy bid'ah in the religion), that Uthmaan (radiyallaahu anhu) was an open caller to "bid'ah" (innovation) and "dalaalah" (misguidance) and "mukhaalafah" (opposition) and "umm al-bid'ah" (mother of innovation), all words used by al-Hajuri in relation to the adhaan of Uthmaan. However, they rush to explain that Uthmaan's action was from ijtihaad, and in this they claim that they are not reviling Uthmaan (radiyallaahu anhu). But as we said earlier, these Muqallidah who blindly follow sayings without scrutiny and thought, do not realize their errors because the view they embarked upon defending was upon fanaticism and hizbiyyah (for al-Hajuri), and such factors consequently blind them and hinder from seeing the truth. You will see from the statements of Shaykh al-Fawzan and Shaykh Ibn al-Uthaymeen that these Scholars do not accept any excuses in this regard, and declare those who speak with the speech of al-Hajuri as innovators. a) Everything that clashes with the Sunnah of statements, actions or beliefs, even if it (arose due to) ijtihaad. c) Every affair whose legislation is not possible except by a text or restriction (to the Book and Sunnah) and for which no text actually exists, then it is an innovation, except what comes from a Companion, and that action is repeated by him without any rejection (from others). Ijtihaad does not remove the label of "misguidance" from a belief, statement or action of bid'ah (and al-Hajuri, has explicitly said it anyway, that the action of Uthmaan is bid'ah, dalaalah and mukhaalafah). Thus, stating "We say it is a bid'ah, but we say he (Uthmaan) made ijtihaad" does not really lighten the matter. This is because no innovator came to his innovation except through ijtihaad. Note how Shaykh al-Albani excludes from the definition of innovation in c) "... what (action) comes from a Companion, and that action is repeated by him without any rejection (from others)." So with this it means that Uthmaan's action of instituting the adhaan cannot be considered innovation, because it was accepted by all the Companions in his time and no one showed rejection against him in the matter of the adhaan, though they showed rejection when Uthmaan completed the prayer (to four rakahs) in Mina during Hajj (which is an error). All of the Scholars of the Sunnah from that time till this day affirm that the adhaan of Uthmaan is a legitimate Sunnah which can be implemented where needed (for the intelligible reason for which it was instituted). And that this became a consensus and a followed Sunnah is mentioned by many Scholars such as Ibn Taymiyyah, Ibn Rajab al-Hanbali, Ibn Qudamah and Ibn Hajar. Shaykh Salih al-Fawzan was correct when he said about these people, "They do not know the difference between Sunnah and bid'ah." What all of the above illustrates, when we take the positioning of al-Hajuri (and those from his followers) in other issues (like not differentiating between the one who does not call to bid'ah and the one who calls to bid'ah) is that despite all their protests - they are in fact more or less tending to the view that Uthmaan (radiyallaahu anhu) was an innovator, calling to his innovation. If they dispute this, then let them take it up with Shaykh al-Fawzaan. Weeks ago, al-Hajuri meeting with al-Fawzaan was a tazkiyah for al-Hajuri. Now, the actual fatwas of al-Fawzaan (that convict al-Hajuri) are tossed against the wall. Haddadi, Hajurite Motivations in Attacking Salafis. When al-Hajuri started making tabdee' and tahzeeb of some from Ahl al-Sunnah upon falsehood and started unleashing his vile tongue against the Scholars of Yemen who did not agree with him and his approach and then began to attack Shaykh Ubayd with vile, foul language, some of his like-minded followers from the West started a campaign against the Salafis in the West who have connections to Scholars in Madeenah and who likewise did not agree with al-Hajuri's extremism. The first to receive this Haddaadi treatment was Abdulilah Lahmami by the ignorant seeker of fame, Abu Fujoor al-Kanadi. This began towards the end of 2009. Abu Fujoor was then exposed well by Abdulilah (see this article) and also in another article by Taqween Ahsan (see here). This Haddadi Hajurite targeted Abdulilah because he has close connection to Shaykh Ubayd al-Jaabiree in Madeenah. He began to find alleged mistakes in cassettes and throw accusations against Abdulilah. Alhamdulillaah, he was exposed as a liar, mischief-maker (read the two articles here and here). After this failure, the Hajurites started on Maktabah Salafiyyah (Salafi Publications) and a series of articles were released against Salafi Publications in general, but also against Abu Khadeejah and Abu Hakeem Bilal Davis in particular. The agenda was very clear. All of this activity was for the sake of supporting Yahya al-Hajuri and underming the Scholars who were not with him and whoever was connected to those Scholars. By 2011 some clear speech was coming from Shaykh Rabee bin Haadee who at this time had remarked that al-Hajuri is a Haddaadi. The Hajurites got incensed and this is when evil speech began to appear against Shaykh Rabee bin Haadee from the tongue of al-Hajuri himself, from his poets and his students. This has been documented elsewhere, refer to the beginning of this article) and (this article). Abu Fujoor, having not succeeded in his previous attempts at attacking Salafis and defaming them, and feeling ashamed for having scored zero points and also been humiliated by the previous refutations against him then decided to move onto myself (Abu Iyaad) in March 2012. Before we speak about that we need to see the connection between this particular action of these Haddaadis and the tactics of the ealier waves of Haddaadis before them. The Haddaadis and Accusations of Irjaa Against Ahl al-Sunnah. From the main activities of the first couple of waves of Hadaadiyyah (Mahmoud al-Haddaad and his followers, and then Falih al-Harbi, Fawzi al-Bahraini and their folllowers) was to accuse the Imaams and Scholars of Ahl al-Sunnah of al-Irjaa'. In this respect Imaam al-Albaani was a primary target (and to a lesser extent Imaams Ibn Baaz and Imaam Ibn al-Uthaymeen). During the mid-2000s the same accusation was levelled by Falih al-Harbee and Fawzee al-Bahraini against Shaykh Rabee and they accused him of saying that actions are a condition for the perfection of eemaan (something for which they spoke with respect to Imaam al-Albani as had the Haddadis before them). There are a number of issues around which the Haddaddiyah revolve in order to attack Ahl al-Sunnah and accuse them of al-Irjaa. From them, a) the issue of the excuse of ignorance (al-udhru bil-jahl), and also b) the statement of actions being shart kamaal (condition of perfection) and c) the issue of jins al-amal (genus of action). Because there are sometimes conflicting statements or ambiguity in the statements of the Scholars (past and present) in discussing these issues, it is fertile ground for the likes of the Haddaadiyyah to enter into these areas as a strategic move and start constructing accusations against the People of the Sunnah based upon the ambiguities therein and carefully selecting from the various statements of the Scholars in order to construct a case. So Shaykh Rabee in his many refutations stood to defend himself and also Imaam al-Albaani (and Imaams Ibn Baaz and Ibn al-Uthaymeen) against these accusations, and he cited from them their use of these types of phrases and stated that alongside this they are free from al-Irjaa and that he himself does not use these phrases which create ambiguity but that these accusations are slanders and oppression against those Imaams, and he pointed out the true and real intent behind these machinations. With the background clear from the previous point, Abu Fujoor al-Kanadi decided to enter, opportunistically, into the same grazing ground as the Haddaddiyah before him and used this issue to launch the accusations of spreading al-Irjaa' against those who did not support al-Hajuri and this was discussed in detail in this thread here. His injustice and oppression was exposed as were his gross slanders. Firstly, he undermined the case of Abu Fujoor because Abu Fujoor brought statements of the scholars showing that Ibn Hajar made an incorrect generalization when using the statement "all actions are a condition for perfection with Ahl al-Sunnnah and all actions are a condition for validity with the Mu'tazilah" and that this generalization is not correct. At the same time, many of those scholars he quoted made use of the phrases "shart sihhah" and "shart kamaal" indicating that the use of these phrases was not the issue but the generalization in applying them which is incorrect. Not all actions are shart sihhah (to the Mu'tazilah) and not all actions are shart kamaal (to Ahl al-Sunnah). When Musa Millington came to the rescue of Abu Fujoor, he only destroyed the case of Abu Fujoor because he said if you use the word "shart" (condition) you are expelling actions from eemaan, and he gave the example of how wudhu is a condition for the validity (shart sihhah) of prayer. Wudhu is external from the prayer and is not part of it, so saying it is a condition (shart) is a description of it as being outside of the prayer. With this, he undermined the case that Abu Fujoor al-Kanadi tried to bring through his citations and upon which he built his accusation of spreading al-Irjaa'. However, in stating this, Musa Millington went one step beyond the Haddaadiyah before him such as Falih al-Harbi and Fawzi al-Bahraini, because they accused anyone who said "Actions are condition for the perfection (shart kamaal)" of being a Murji' and spreading Irjaa' because in their view actions are a condition for the validity (sihhah) of eemaan. The argument used by Musa Millington meant that everyone who used the word "shart" (condition) whether for the perfection (kamaal) or validity (sihhah) of eemaan had fallen into Irjaa, because the mere use of the word "condition (shart)" means the expulsion of actions from eemaan. When this was pointed out to him - that this was the implication of the angle he was coming from and that this is a complex subject that requires a more sophisticated treatment otherwise we will start making false accusations against the Scholars - and this was mentioned repeatedly to him, the ignoramus failed to acknowledge it, and simply went on to send out a series of refutations thinking that a barrage of refutations will save him and his companion Abu Fujoor al-Kanadi. Foolish is the person who thinks that to get out of a pit you have to dig deeper! b) Secondly, from that in which Musa Millington made a fool of himself was that when I explained in that thread that since there is ambiguity in the intent behind these phrases (shart kamaal and shart sihhah) from those Scholars using them, and the Scholars vary in their usage and affirmation or criticism of these terms then one must verify what is intended in the usage of these terms upon the principle that anything which is ambiguous or general in its meaning must be clarified (to reveal the intended meaning). Here Musa Millington made his second foolish mistake, uncovering his ignorance and proving that his intent was only to refute for the sake of covering and rescuing his partner Abu Fujoor al-Haddadi. This mistake was to accuse me of implementing the false principle of Abu al-Hasan al-Ma'ribi known as "Mujmal and Mufassal." Now what Abu al-Hasan al-Ma'ribi was doing was to use what is otherwise a correct principle (a genuinely ambiguous, generalized statement must be clarified and explained so the intent is clear) and applied it in a way so as to defend outright statements of innovation and falsehood which were coming from himself and some of those figureheads he was trying to defend from the takfiris and Kharijites such as Sayyid Qutb and Muhammad al-Maghrawi. So for example al-Ma'ribee described the Companions as "scum" (Ghuthaa'iyyah) and al-Maghrawi made outright statements of Takfir and khurooj. Now these are not "mujmal" (general) statements, they are outright falsehood whose meanings are very clear and plain. When a person describes the Companions as "scum" there is nothing ambiguous or general about that. Hence, the principle "we must look at his detailed speech in other places," cannot be applied here. This is false because its trying to say that if a person says "The Companions are scum" in one place and then another place he speaks well of the Companions, that somehow he is free of blame and free of criticism and that we cannot judge him of having reviled the Companions. This is what al-Ma'ribee was intending. If you applied this false principle (of al-Ma'ribee) you could start defending a large number of deviants and innovators and accommodate mistakes and deviations. Now, Shaykh Rabee' when he wrote his detailed paper in refutation of al-Ma'ribee, he made this very distinction that I went on to explain to Musa Millington (see this post), the difference between a correct application of "mujmal statements must be clarified" and between outright statements of falsehood that do not comprise any other meaning but a meaning of falsehood (and hence it is futile to apply that principle to these types of statements). Musa Millington failed to realize this and again wrote refutations in this regard. His attempt all along was to side with Abu Fujoor al-Kanadi who had been grazing in the very same pastures of those Haddaadiyyah who made use of the issue of shart kamaal as a means to accuse Imaams al-Albani (and Ibn Baz and Ibn al-Uthaymin) and Shaykh Rabee himself of al-Irjaa'. So this was a very cheap attempt to continue his slanders and attacks upon anyone connected to the Shaykhs of Madinah or Shaykh Ubayd in particular and to Shaykh Rabee and others and who were not in agreement with the path of Yahya al-Hajuri and all of whom had started speaking about Yahya al-Hajuri openly. Within this context, some time later, I wrote an article in (September 2013) titled, "A Refutation of Musa Millington and Abu Fujoor al-Kanadi: Shaykh Rabee' on those Who Accuse al-Albaanee of Irjaa Due to the Phrase Actions are a Condition of Perfection in Eemaan" (see here), which was a refutation of the Haddaadiyah in general, against the original Haddadis (Mahmood al-Haddaad) and the second wave (al-Harbi, al-Bahraini) and then against these Hajurite Haddadis who started grazing in the pastures of the Haddaadiyah before them and who made use of this issue to accuse the Salafis with what their predecessors had accused Imaam al-Albani and others with. This being a cheap opportunistic attempt on their behalf to belittle those who did not agree with Yahya al-Hajuri. So in that article, all of them were lumped together, because they all employed this issue for their own nefarious ends, and hence the refutation of Shaykh Rabee in (that article) was a refutation against all three of these groups because all three are grazing in the same pasture and eating from the same grass and coming from the same angle in order to attack Ahl al-Sunnah, even if the likes of Musa Millington and Abu Fujoor protest they do not accuse al-Albani of al-Irjaa'. You chose to eat from the same pastures where that accusation came from, and hence you will be rightly mentioned in connection with those in whose pastures you chose to graze. It is here that Musa Millington began jumping up and down - after his disgraceful actions - and began to make challenges of mubaahalah because he felt he had been accused of accusing Imaam al-Albani of al-Irjaa. To help Musa Millington understand the realities, he should realize the situation is similar to when Shaykh al-Fawzan and Shaykh Ibn Uthaymin declare his likes of making tabdee' and tadleel of Uthmaan (radiyallaahu anhu) and do not accept any of their excuses and protests such as "Uthman made ijtihaad, we do not say he is a mubtadi". Rather, Shaykh al-Fawzaan says, "You (people) desire to make tabdee' of Uthmaan." So within this context, if you Haddaadis are going to enter the pastures of the Haddaadiyyah before you such as Mahmood al-Haddaad, Falih al-Harbi and Fawzi al-Bahraini, and chew the grass they are chewing and then stir up their arguments to attack Ahl al-Sunnah, through the use of certain knowledge based issues which have been chosen strategically for the purpose at hand, then you will be thrown alongside them and your arguments will be refuted in connection to them and their statements, because that is where you came from, from a strategic point of view (for no other reason but to support the cause of Yahya al-Hajuri). There is no oppression going on here. Your intentions were insincere from the very beginning. You were exposed. You were simply put in your place. You are grieved by it. And now you are waving the "oppression" card, when you are the ones who started the agression and oppression in the first place, just to support the cause of the Innovator, Yahya al-Hajuri. If you claim you do not accuse Imaam al-Albani of al-Irjaa (just like you claim you do not accuse Uthmaan of being an innovator) - then free yourself from this approach you borrowed from the Haddaadiyyah before you and the arguments used by the Haddaadiyyah before you, the same ones used to accuse Imaam al-Albani (and others) of al-Irjaa, the same ones which Abu Fujoor relied upon in his cheap attempt (discussed here), and for the sake of which Musa Millington came to his rescue. Similarly, as this is the subject of this article, free yourself from saying Uthmaan instituted bid'ah if you are really truthful and sincere in saying "We do not make tabdee' of Uthmaan." Finally, if Musa Millington is so keen on making mubaahalah, then let him roll up his sleeves and make mubaahalah on whether Uthmaan's action in instituting the second adhaan for an intelligible reason is "bid'ah," "dalaalah" and "mukhaalafah." Then we will see the coward from the upholder of truth.